As you can imagine, being able to Cast Chrome Browser to TV will allow you to start playing your favourite Videos and Movies on the Chrome browser of your iPhone and watch them on the bigger screen of your Home TV. 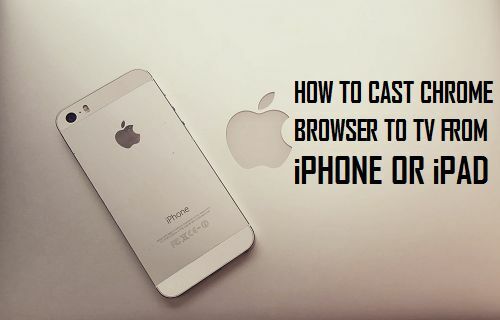 Google’s Chrome browser has an in-built “Cast” feature, which should allow you to watch Videos playing on the Chrome Browser of your iPhone or iPad on the bigger screen of your Home Television. Unfortunately, the “Cast” option of Chrome browser does not appear on many websites. Hence, we will be making use of Video & TV Cast App to Cast the screen of your iPhone on the big screen of your Home TV. As you must have figured out, you must first Setup Chromecast device to work with your TV and iPhone, before following the steps to Cast Chrome Browser to TV. 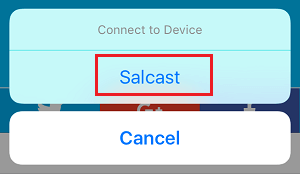 Follow the steps below to Cast Chrome browser to the big screen of Television using the TV Cast App as available on the iTunes Store. 1. Open the App Store on your iPhone or iPad. 2. Once you are in App Store, tap on the Search icon located at the bottom of your screen (See image below). 3. On the next screen, search for Video & TV Cast App. 4. Download and Install the Video & TV Cast App to your iPhone. 5. Next, open the Video & TV Cast App on your iPhone. 6. The Video & TV Cast App should immediately connect with your Chromecast Device. To confirm, take a look at your iPhone and see if you can find a Cast icon on the screen of your iPhone (See image below). If the Cast button is Coloured blue then your Chromecast is indeed connected with the Video & TV Cast App (See above image on the right). 7. After tapping on the Cast button, you will see a list of Chromecast devices on your internet connection. Tap on the Name of Chromecast device that you want to connect to. 10. As the Video starts playing on your iPhone, you will see “Tap Here to Cast” link at the bottom of your screen (See image below). 11. Simply, tap on the link next Tap Here to Cast and the Video will start playing on the big screen of your Home TV. 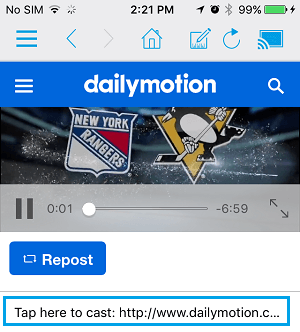 While the free version of Video & TV Cast App allows you to cast videos from any website to TV, it does not allow you to Forward or Rewind the Videos. This feature is available in the paid version of the App, available for an In-app Purchase of $1.99. There is also a Full version of the Video & TV Cast App, available for $6.99. This version allows you to block ads, bookmark sites, use desktop mode, change the homepage and Cast videos from the Camera Roll. Whenever you are done watching the videos on the big screen of your TV, you can stop Videos from Casting by following the steps below. 2. You will see a pop-up menu at the bottom of your screen, tap on Disconnect to stop the video that you are currently watching. After the Video Stops playing, you can watch another Video at any time by opening the New Video on your iPhone and immediately tapping on the Tap Here to Cast link that you will see at the bottom of your iPhone’s screen.